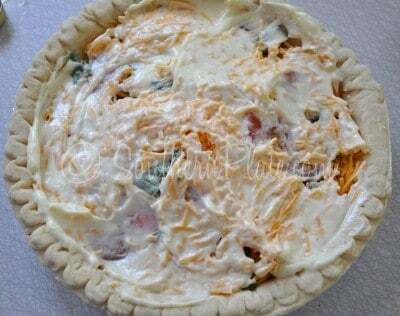 Christy and all mayo haters, try substituting an equal amount of cottage cheese, drained and a couple of squirts of fresh lemon juice for that old fattening mayo. And, please, please use fresh basil. I t tastes so much better!! How would it be if you roasted the tomato’s first!! Yum – What if you subbed fresh sliced mozzerella for the cheddar and made a caprese pie! You’ve already got the basil and balsamic. I may have to try it both ways just as soon as I get back from this dang business trip tomorrow!! Just waiting for my maters to get ripe. I am with you on the Mayo but hope I can’t taste it. I love all your recipes so I am sure it will be a keeper. 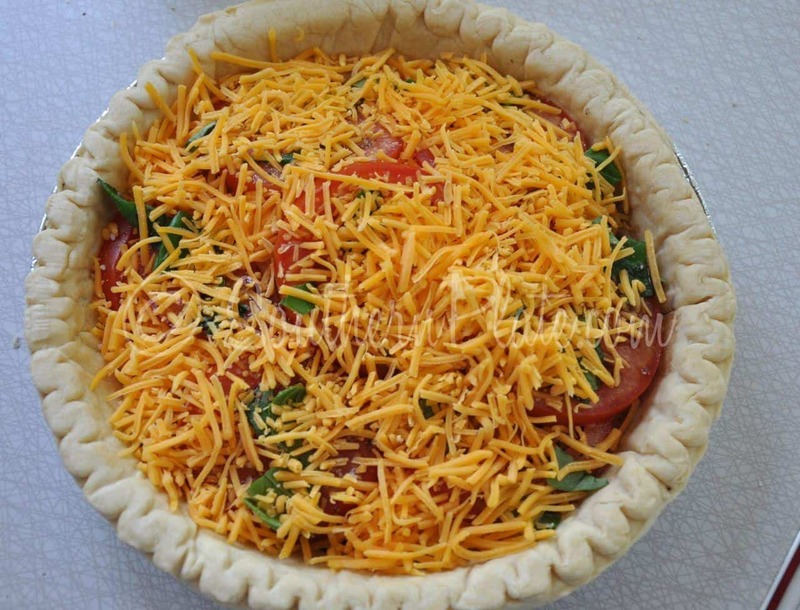 Can’t believe I’ve never heard of tomato pie. This is the first time ever that I have even heard of a Tomato Pie. Seriously. Did you just create this or something? 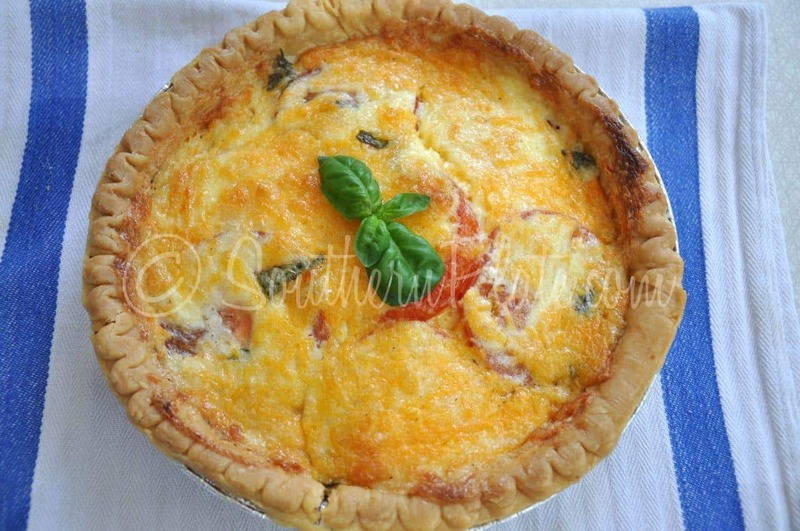 Well, I created this one but Tomato Pie has been around for ages! Nothing says summer like a Tomato Pie. Yummy!!!! I have to agree Betty!!! Gee golly I wish I had seen this while I was at the grocery store! It looks delicious & is going on my list for next time. I hope you get to make it soon Brandy!! O Happy Day! I went to lunch expecting to dine on Tate Farms Tomato Pie but alas, that was Monday’s Special not Tuesday’s. Now I can make this recipe and satisfy my hankering. I’m glad you can grow tomatoes! We seem to be squirrel and rabbit free around here but my husband had to relocate our tomato plants from the backyard to the side landscape to keep our Cocker Spaniels from devouring them right off the vine! I hope you like it Karen, can’t wait to hear your thoughts!!! Your dogs like tomatoes? Wow, mine won’t touch them. 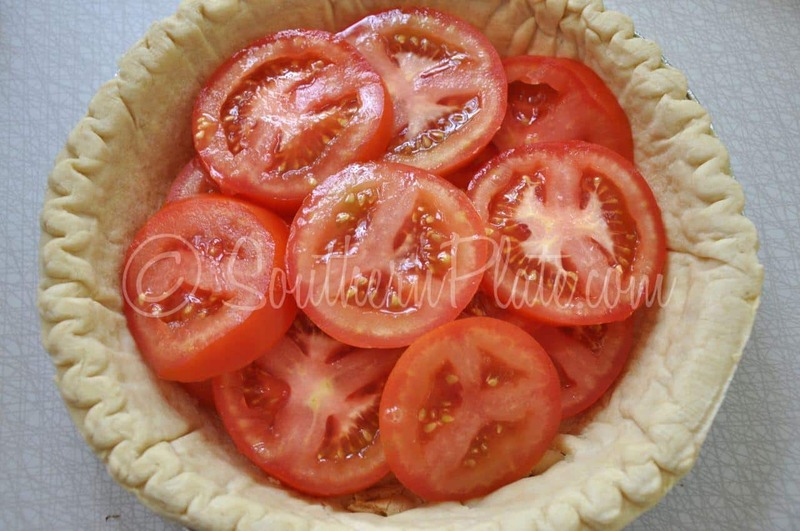 The Tomato Pie was absolutely wonderful–it cured my hankering & relieved my fears that I wasn’t going to develop a taste for “balsamic” vinegar! It was so good we ate the leftovers for breakfast. Thanks for the recipe, she’s a keeper! And yes, my tomato-picking dogs love tomatoes. One discovered the new tomato patch Friday evening. 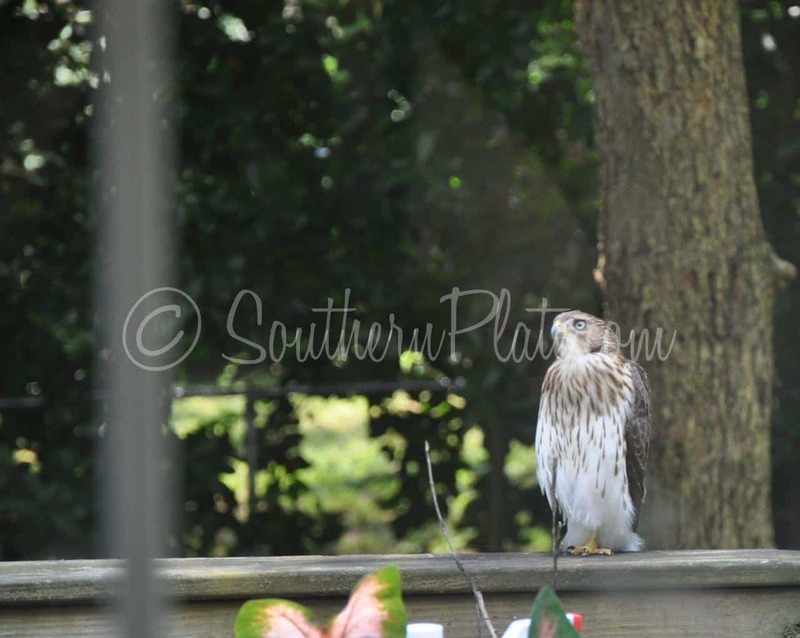 I knew something was up when she reluctantly came inside–with crape myrtle blooms dangling from her ears. The next morning we found an almost ripe tomato half-eaten on the vine! I love tomato pie. I dice my tomatoes. Makes the pie easier to cut/serve. I also make the crust with dried basil in it. So good! Will make it this weekend! Sounds wonderful and easy. Just what I love. I love maters. I can’t wait until your new book comes out. I know that it will be wonderful!!! I hope you like it Pam!!! You know it’s very good luck to have a hawk actually sit and watch….that means your dieting is going very well! 🙂 You just aren’t juicy enough for him! ~giggles~ I just love your thinking Dorie!! 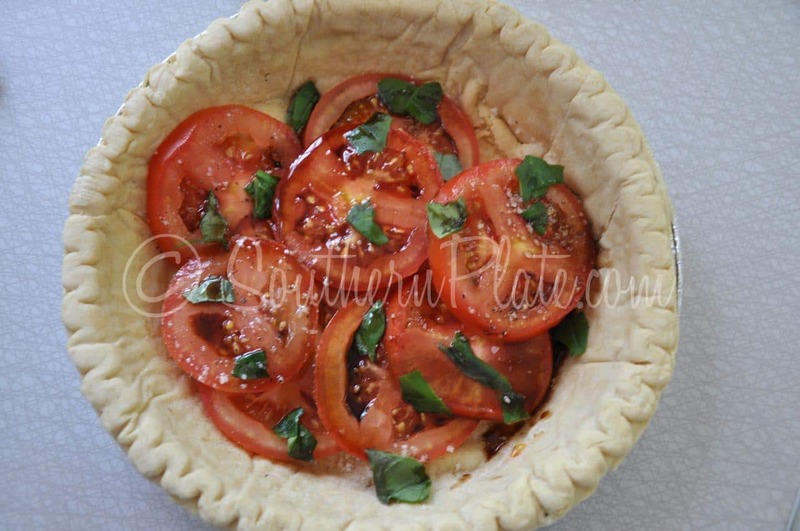 LOVE Tomatoe Pie…I like my tomatoes slightly underripe tho- the taste kinda reminds me of Fried Green ‘Maters…. Ohhh, I that sounds so good Sunny!! 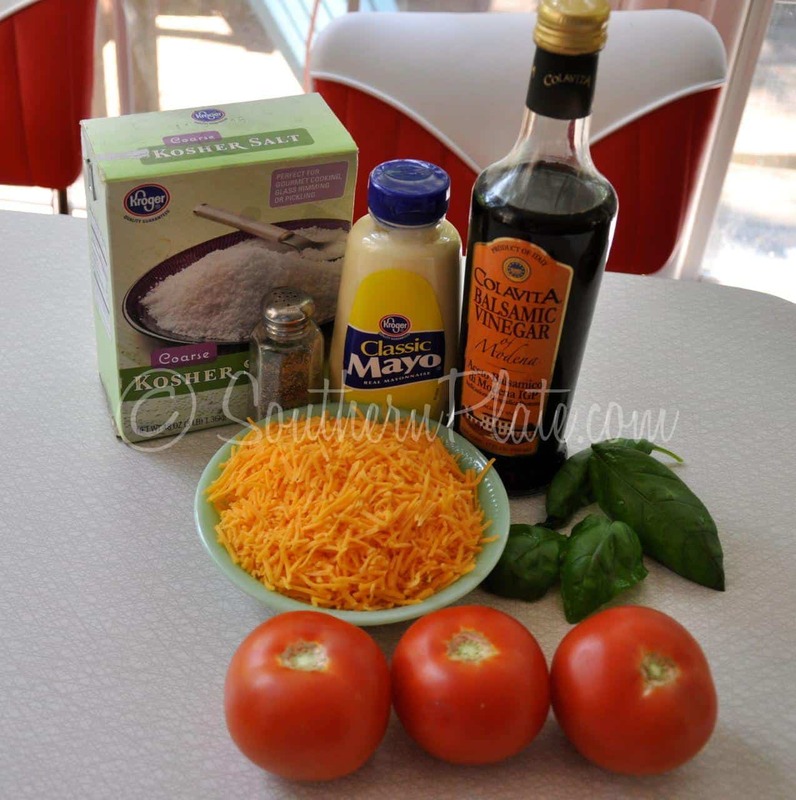 the tomatoes in the store here ..yuk…AS FAR AS MAYO .I only like Hellmans .no miracle whip here…Christy this one would give you a good question to ask your followers .mayo or miracle whip…just a thought dear .. I might have to try this tonight. 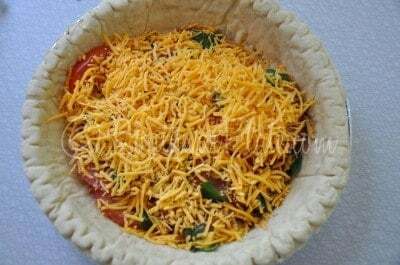 I have lots of tomatoes at the moment (although they are dwindling now that the blueberries are getting scarcer and the birds are looking elsewhere for fruit) and need something quick and easy to cook so that I can work out in the yard before it gets dark. 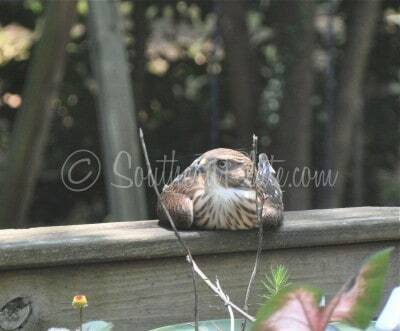 We get those hawks, too. They are Cooper’s Hawks, I think. They are attracted by all the mice, bunnies, and fat doves in my neighborhood. I sometimes worry about my chickens when I let them out, but I think they may be too big for the hawk and the hens are pretty good about staying under bushes! 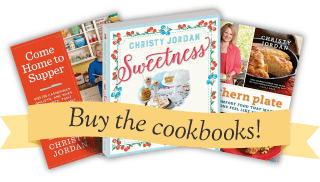 Christy do you have a simple recipe for sweet pickles using pickling spice? Thank you for sharing your stories and recipes. 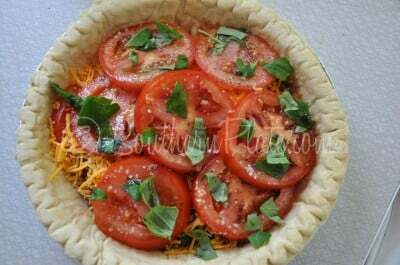 Sooooooo Yummy Tomato Pie! I had a first yesterday at Cullman Hospital Cafeteria….Scalloped Tomatoes. I thought it was a rice dish, but ordered it anyway….it was TASTY! I hope you enjoy it Peggy!! 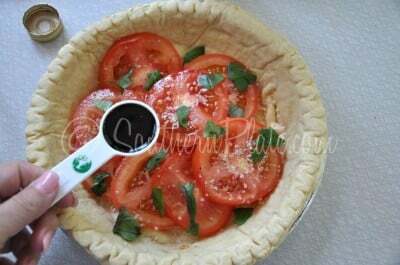 Definitely making Tomato Pie!! Got some good friends visiting from New York during July 4 week. 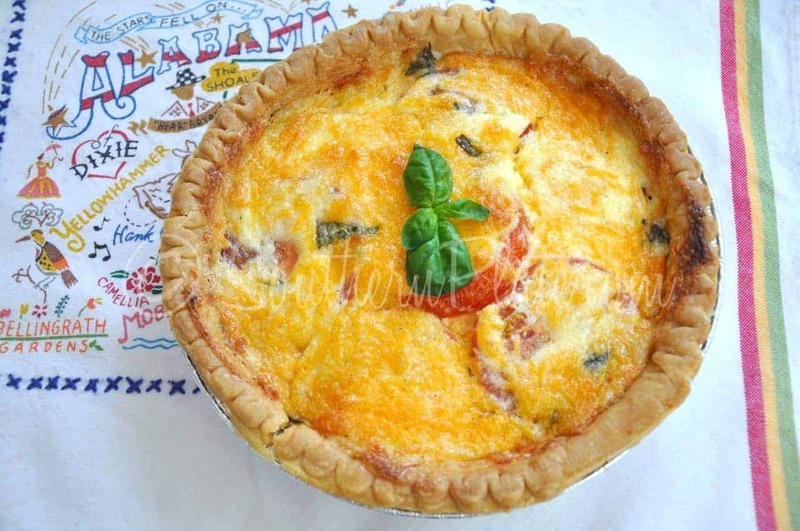 They want one of those Alabama Dish towels like the one the finished Tomato Pie is sitting on. Do you know where you got it? I have a counter full of beautiful red tomatoes (from a friend’s garden), cheese in the fridge, and a frozen pie crust in the freezer. That’s what is so great about your recipes, I almost always have the stuff! I am also making your sticky chicken and creamed corn (made with frozen corn) to go with it. I end up on your website almost every morning to help me with making my supper plans. I am not a novice…I’ve been married for 42 years and am sort of “famous” among my family and friends for being a great cook. I just love the way that you find joy in cooking old fashioned, family loving recipes. 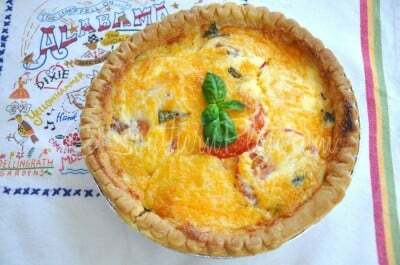 Never heard of tomato pie but it sure sounds good! Not a big mayo fan either. The only time I use it is for tartar sauce. Otherwise we’re Miracle Whip fans all the way. Can Miracle Whip be used instead of mayo of this pie? I made this last week & my husband ate all but 2 pieces of it! He loved it! It’s a keeper! Making this tomorrow! Can’t wait to taste it. When I first saw this recipe I knew I had to give it a try. Although I must admit that when I started putting it together, I began to second guess if I was going to be able to get my kids and family to try it. Maybe it was the delicious aroma or the way the golden, bubbly cheese topping made their tummy’s growl, but regardless, it was a huge hit!!! I will definintely put this at the top of the list for when company stops by or I need a dish for a pot luck. Once again, another home run Christy, Thanks!!!! I am so glad to hear that everyone liked it Brittani!!!! Two things: 1) Peel tomatoes….difficult to cut nice/perfect slices of the cooked pie with skin on tomatoes; 2) seed the tomatoes! I salted and drained water (loads) off the tomatoes for 20 minutes and STILL watery after cooking. 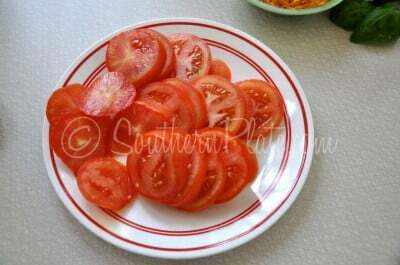 SO, this is a keeper if you use Roma tomatoes that are peeled and seeded. If you don’t have time to peel; then, cut into smallish pieces after slicing. “Balsamic Glaze” from “Trader Giottos” is thicker that regular “B” vinegar and will not add additional wateriness to pie. Made this over the weekend for a family cookout at the lake. Everyone loved it and it was so easy to fix. Thanks for another great recipe! I am so glad to hear that everyone liked it Sara!!! I made this last night for dinner. Hubby really liked it–he ate 2 slices. Our daughter who was visiting even ate a slice. This is an easy recipe and versatile–thinking about using it for a bunch. Thanks for sharing. I made this over the weekend with a gluten-free homemade pie crust and mozzarella cheese (instead of cheddar) – pretty good! My husband is a skeptical diner when HE’S not the chef – and he liked it, too! He even shot down a few suggestions I made… though I’ll probably still do them, haha. I will decrease the mayo on top next time. It was too much for me and really limited how much of the pie I could eat. I also may increase the balsamic vinegar a smidge as I couldn’t detect it. 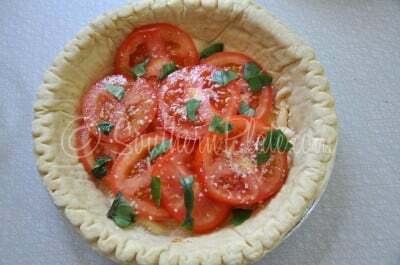 I did not skin or seed my beautifully plump farmer’s market tomatoes and the pie wasn’t watery at all. It was great! Can’t wait to make it again!